Epidermoid cysts are asymptomatic, slowly enlarging, firm to fluctuant, dome-shaped lesions. Epidermoid cysts frequently appear on the trunk, neck, face, and scrotum, behind the ears and in the palmoplantar region. 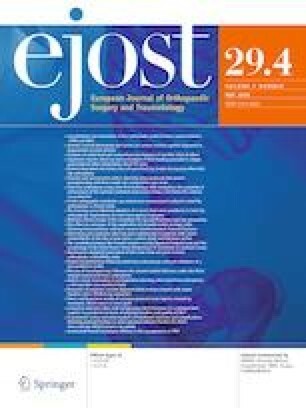 We review all the cases of epidermoid cyst of the knee and present a case of non-traumatic-induced epidermal cyst in the popliteal fossa of a 66-year-old male with 10-year history of right knee swelling, which appeared firstly as a small mass 2 × 2 cm in the popliteal aspect of the knee. The mass was increasing gradually in size until 2 years ago when it increased suddenly to gain the dimensions of 4 × 6 cm. MRI of the right knee revealed a well-defined cystic lesion in the subcutaneous tissue measuring about 7 × 5 × 5 cm containing internal debris and septations. He underwent complete surgical excision of the mass. The pathological results revealed an epidermal inclusion cyst. To the best of our knowledge, this is the second description for epidermal inclusion cyst involving the popliteal fossa. We were able to retrieve three cases of epidermal cyst of the knee from the literature since its first description in 2004. Including our case, we had a total of four cases of epidermal cyst of the knee. Three males and one female constituted the patients’ sample. The mean age for the patients is 55. The epidermal cyst occurred equally in both knees. The popliteal fossa was the location for two epidermal cysts. Similarly, the prepatellar region was the location for another two cysts. This article has not been published or presented elsewhere in part or in entirely and is not under consideration by another journal. All authors have approved the manuscript and agreed with submission to your esteemed journal. The authors declare that they have no competing interests.